Laura is 22 and comes from Holland. She was at university for accounting but gave it up to come over to England to continue working with horses. She came over to the UK with her 6 year old event horse in August 2018 to work and train at a Show Jumping yard, HK Horses. With experience working for Siemerink Stables (a yard that breaks showjumping horses) and for Olympic Dutch eventing rider Alice Naber Lozeman, Laura is new to racing. 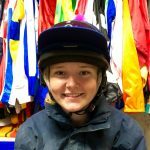 With no racing in Holland, she was excited to be a part of it here in England and is really enjoying her job at Bethell Racing. 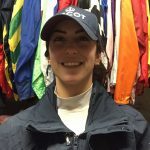 Having started in February 2019, Laura already has many 3 year old fillies as her favourites, particularly Well Funded and ex Winter’s Night, and is looking forward to the season with them and the others. She is also really looking forward to learning more about racing and leading up at the races. Laura still really enjoys eventing, having grown up riding in many shows, with riding cross country being her favourite part. No doubt she will enjoy the likes of Badminton and Bramham Horse Trials.